The Surrey Eagles will begin the Mainland Division Final on Friday night when they renew their rivalry with the Chilliwack Chiefs in Game 1 of the best-of-five series. The Birds advanced to the second round after beating the Langley Rivermen in four games while the Chiefs needed five games to eliminate the Prince George Spruce Kings. 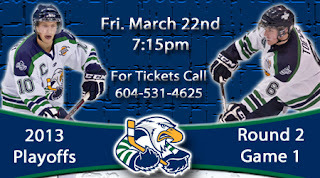 The Eagles enter the second round coming off back-to-back six goal games in which Adam Tambellini scored five times. Defensively, the Surrey hockey club only allowed six goals in the first round, and Michael Santaguida had a good series in goal including a 2-0 shutout in Game 1. Surrey's special teams were a definite positive as well as the Eagles were 25 per cent on the power play and 80 per cent on the penalty kill in the four games against the Rivermen. Chilliwack was forced to play five games in six days after their series with Prince George went the distance. The Chiefs advanced thanks to a 5-2 win on Wednesday night at home, but they only had one day off before the beginning of the Mainland Division Final. Phil Zielonka has been an offensive force for Chilliwack, tallying a league-best seven goals in the opening round including a pair in an impressive 10-1 win in Game 2. If you're attending the game, bring your radio and listen to the play-by-play on 88.7FM.